Business Planning Templates for Excel (Office Ready) are an entire tool set necessary to create a winning business plan. This unique product includes Excel spreadsheets with formulas that crunch numbers, a plan document template, sample plans, an eBook guide, a built-in PDF publisher and presentation templates. Excel Business Planning Templates include predefined templates that contain outlines and instructional text to help you get your plan started. It also includes real life examples from a variety of industries for your plan. Excel Business Planning Templates offer not only conventional business but detailed e-commerce planning. It also grants access to venture capital plans, and more. Year 1 Sales Forecast: This worksheet is the sales forecast for the first year of the planning period. 5 Year Sales Forecast: This worksheet summarizes the sales forecasts for the entire 5 year planning period. Year 1 Cost of Sales: Use the Cost of Sales worksheets to estimate costs that are directly associated with your products and services. 5 Year Cost of Sales: Use the Cost of Sales worksheets to estimate costs that are directly associated with your products and services. Start-Up Capital: The purpose of the Estimated Start-Up Capital Sheet is to help you determine how much cash you will need up-front to finance the launch of your business. Start-Up Capitalization: Use this sheet to forecast the amount of Capital Stock and Long-Term Debt you will use to Start-up your venture. Personnel Plan: The Personnel Plan helps you estimate your payroll expenses in three categories: Direct Payroll, Selling Payroll, and General & Administrative Payroll. Income Statements: The Income Statement sheet allows you to prepare projected income statements for the five-year planning period. Cash Budgets: This worksheet indicates the most important element of your business plan projections: how your projections and forecasts generate cash. Balance Sheets: The Balance Sheet shows what you own (assets), owe (liabilities), and the equity of the owners. Break-Even Analysis: This worksheet allows you to calculate a break-even point. The break-even point for a business is achieved at the moment the sales volume covers all costs (both fixed and variable). Plan vs Actual: This worksheet contains projected Income Statements, Cash Budgets, and Balance Sheets into which you can enter actual results. Financial Highlights: The last sheet of the workbook is the Financial Highlights worksheet. This table includes key financial ratios. A comprehensive Microsoft Word template as the basis for the entire business plan. PowerPoint Templates to help you create a professional presentation quickly and easily. The Document Adviser will let you know, what, where, why and how you should use every tool we provide. Publish your business plans to PDF format with the program's built-in PDF publisher. Ideal for distributing the plan electronically. Additional guides are dispersed throughout to help you along the way. The Office Ready Photo Editor quickly crops, resizes, or adjusts brightness of images. Updated user interface makes it simple to find plan resources including the plan document templates, the Excel workbook, the PowerPoint template and the sample plans. Microsoft Office Integration, allowing you to work in a familiar environment and use the variety of tools that Microsoft Office supplies. Excel Business Planning Templates are totally flexible and allows you to import documents, tables and graphs with ease. You can also insert and edit photos or word art, add company logos and clip art with equal ease. 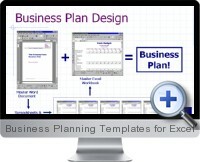 Excel Business Planning Templates are ideal for writing traditional and Internet business plans. They offer the facility to instantly convert your plans into PowerPoint presentations or turn your full plan into concise summary plans. This product also provides sales and marketing analysis tools.